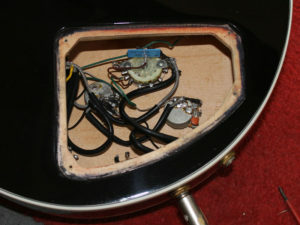 As the guitar’s owner didn’t find the stereo feature of the guitar useful, there was an opportunity to convert the guitar to mono, and use the now redundant other half of the Varitone switch to switch the choke in and out of the circuit. 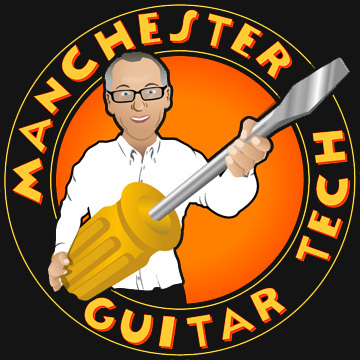 I found a post on the Les Paul Forum where someone had done a similar job on his Gibson ES-345 and kindly provided a wiring diagram. The modified guitar now has a lot more volume in the bypass position and suffers no loss of tone. Another excellent job. Thanks for the suggestion and the excellent work Steve. Hello! I have a Gibson Lucille 1987 model, and the tone knob to the bridge pickup does not work. I looked at the electronics back in the guitar, and from the tone knob there is a small green cable unplugged to anything. Have no clue where this is supposed to be attached. Can you help me? Both sides of the circuit are the same so you should be able to copy the neck pickup circuit. Hi Steve, can you think of any other ways to make the choke optional , without forgoing the double jack inputs or doing anything else non-reversable ? If no, would there still be an effect on tone if the choke was out permanently ? Would you recommend any particular mod in general ? thank you.